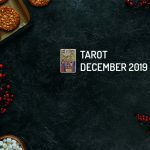 In Tarot for December 2019, The Lovers is the arcana that dictates the month and it indicates man’s doubt between two halves that are part of a greater whole. This card number is six, which in numerology corresponds to beauty. And in order to find this beauty, this aesthetic balance, you will have to take your emotions and feelings into account. You will have to choose between two options that each have their advantages and disadvantages. This card will make you weigh your options to see if you prefer security but also the tedium it entails or the uncertainty but excitement that the other offers. Because The Lovers is a hidden message, a return to youth, to the very high possibility of making a mistake in our choice, but it also shows the innocence of not knowing which way to choose. In almost evert type of tarot, The Lovers features two women and an angel armed with bow and arrow pointing from the sky. The man must choose, make his decision correctly. Before him he has two different women. One wears a crown, which represents order and morals, while the other, with loose hair, is the symbol of heterodoxy and a free sense of life. In Tarot for December 2019, The Lovers indicates that it represents a choice whose result will be satisfactory. However, you must make a decision that normally will not be easy. Thus, the card will respond affirmatively to whether we are going to marry a certain person but in exchange we will have to give up something else, change something in our life that cost us a lot of work, such as leaving the home of your family, moving out of town. And on a family level, this card also indicates that conflicts may arise between daughters-in-law and mothers-in-law, or there may be problems in which two members of the same family are in love with the same person, something that has happened more than once with two brothers who long for the same girl. In terms of health, making decisions to lead a healthier life will make us be more conscious of our eating habits, doing sports, etc. Without a doubt it is a card that is very related to love and feelings, where the choice you need to make will be difficult but surely right. Loving relationships may also be affect by a third person who disturbs couple’s peace. At work will have to make important decisions regarding certain projects we are participating in, so we will have to let our reasoning guide us, in addition to feelings.